20 million views … and counting. As far as I’m concerned, this pretty well cemented his position as coolest dude there has ever been. I mean, Canadian plus astronaut plus Bowie? That’s the trifecta of cool right there. Like a lot of people, I assumed that Hadfield had an amazing innate understanding of what worked and didn’t work as content. He had been posting neat and interesting content to the web for months —- great tweets and YouTube videos on funny, everyday aspects of life in space. They were memorable, they were highly shareable, and they paved the way for that 20-million view bombshell. So imagine how surprised I was when I read Hadfield’s biography — and found out that when he was getting started, he was actually sort of an idiot about content. But he knew where to go for help … the kind of help that you might benefit from as well. Hadfield was on Twitter fairly early on … but (by his own admission) his content was pretty bad. It was boring. It was dry. It wasn’t well suited to the medium. Fortunately for us, Hadfield’s son Evan is really smart about content. He helped his dad understand what kind of content was worth posting — and would get people talking. Evan continued to work with his dad on how to make his content more remarkable — up to and including suggesting the Space Oddities cover, and working on securing the rights and getting the video edited. 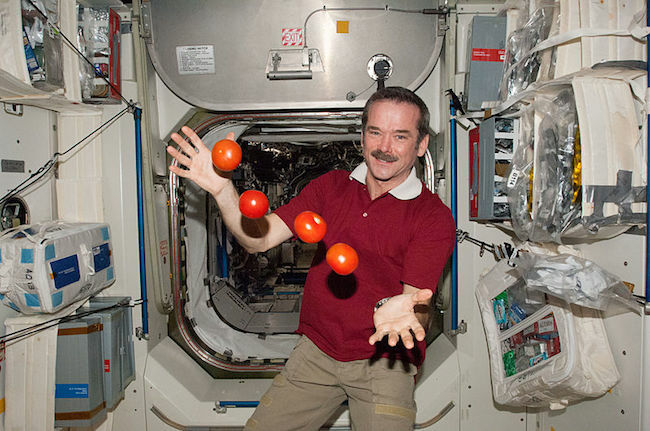 Chris Hadfield is arguably the most effective promoter for space travel since human beings first landed on the moon. But he couldn’t have done it without his behind-the-scenes help — the “entreproducer” who understood how to make it rain. In other words, Evan was the one in charge of guiding his dad’s presence and keeping the Seriously Cool factor cranked up to 11. This is the role a professional content strategist or new breed copywriter can play for you. You might have amazing abilities. Maybe you’re the equivalent of a space station commander in their field. But that doesn’t mean you understand anything about what makes content memorable. The words matter, but the strategy matters even more. Understanding what the audience wants. Understanding how different formats work together. Understanding what makes content shareable. Understanding how content creates the overarching message you want. Understanding how to drive the behavior you need, whether it’s a sale, an email opt-in, or international support for the planet’s patchwork of space programs. When you hire a copywriter or content strategist, you may be paying for their wonderful words (or video and audio skills, as the case may be). But remember — you’re also paying for their rainmaker hat. Keep the world’s coolest person in mind when you’re looking for a writer for your website. What you need is someone who knows how to make you remarkable and memorable. I’ve always created my own sales copy and I’m definitely not an expert at it. Understanding the needs and desires of your target audience definitely helps create copy that sells because you can craft a marketing message that resonates with your audience. Personally, I can’t see myself ever hiring a pro copywriter. Why? Because if they’re not as passionate about your product or service, surely it will shine through their words! What’s your opinion about this? Because if they’re not as passionate about your product or service, surely it will shine through their words! It’s the professional copywriter’s job to convey that passion. Generally, they do a better job than the business owner because they take nothing for granted. They find amazing gems about the business that the owner overlooks. But how to covey passion artificially when we are really not connected with the product? In my openion professional copywriters are “smarter” rather than “passionate”. As Brian mentioned, that’s why they are “professional” copywriters and content writers. They have this innate ability to get under the skin of the passionate writer and then create copy that makes the right impact. I totally agree with you that unless you can really relate to the product and are really crazy about it it might be difficult to write about it as passionately as needed, but this is a talent copywriters and content writers either have by default or they develop it, and they charge a premium for it :-). Besides, no matter how much passion one has, if he or she cannot translate that passion into right words, it can all go to waste. I’m not saying that you hire a copywriter even if you don’t want to, but if you ever hire one, maybe you can work with her – your passion and her words can weave the required magic. So that makes Brian Clark the Quentin Tarantino of bloggywood. It make sense now, great ! It helps if you be in a niche and write for companies and products that you can get passionate about. I love to write, but am not a copywriter – yet. Maybe some day. Everything I read here at Copyblogger points me in the right direction, this article included. Thanks Sonia for the strategy information behind becoming a good writer and communicator. It’s a little like becoming a Pied Piper – attract the audience and make it overwhelmingly impossible for them NOT to follow you wherever you might lead them! Finding a writer that knows how to make you remarkable and memorable is a challenge. Those who have this gift are often booked up months in advance. I would looooove if someone could refer me a few really good writers, preferably writers with marketing skills. You can start by checking out the websites of our guest writers, 90% of them take freelance work. Clicked through to your landing page (mobile)…and here is what I would add. I would highlight the “result” (more money, better: health, relationships) that can come from the process that you teach. I would highlight “real” success stories that have come out of this coaching. An increase in business, money or a higher position; better relationship and health. Whatever your market wants in results, give it to them in the copy in the form of stories about you and or your clients successes. Communicate (sell) the amazing, life changing outcome; teach them the process. Another great post, Ms Simone. “Pay great attention to the man behind the curtain” is quite a concept. I had no idea that Hadfield had such a person, let alone his son. Doesn’t that make him about the ‘pick 4’ of coolness? Working with his son? Being a good writer, then advancing to being a copywriter is my set target to achieve this year 2014. I appreciate the advise and insight always being shared on copyblogger. Love this – because his work is SO popular, and worth digging into and emulating. Thanks for the backstory! You had me at Chris Hadfield! I know, isn’t he the best? If you haven’t picked up his book yet, it has about a trillion life (and business) lessons in it. Very inspiring post — as ever ! But just a little thing : making an event (and a viral content) playing with oranges in space is totally sur-natural today. In 100 years, it would possibly be ‘inconsistent’. What a good copywriter has to bring to his client is exactly a kind of touch of sur-natural thing… And brands like RedBull totally gets it ! Nothing beats a content strategy that is tailored to the wants of the audience. That astronaut took the boring of being up there in space to the awesome experience of doing things that still wow us on this planet. Now the question(s) is where do you find ideas to take your content production to the next level? Thanks for the post Sonia. How true! That’s the difference between writing tweets and writing EFFECTIVE tweets (or any kind of content for that matter). Thanks for sharing this story! No one knows the business like the owners and employees. A great business understands their usefulness in addressing their customers’ urgent problems. What an outsider brings to the equation is the ability to see the business’ uniqueness. If those outside eyes belong to a talented copywriter and content strategist, then they can construct a story-arc peppered with ultra-specific vignettes from the business that illustrate the passion and purpose of the owners. Agree with the whole thing, but I’d like to point out that it’s a learning curve for everyone. You not only learn more about social media and your audience, you learn more about yourself. I was teaching a class on blogging last month. Someone asked me how they could blog without already being an “expert”. My answer was that they would grow into themselves as they dealt with their content on a daily basis. Second is magnetizing the reader’s undivided central attention on our message. This is the unavoidable judgement we must pass on the cover of our book, or the headline and associated image that announce the destination of our journey. Even the most epic journey begins with a single step, but that step is not in the foot, but in the heart, with the desire to bring oneself to the journey’s end. Engaging the mind in the linguistic syntax of our copy, we carry our reader’s mind through the essential steps for a successful sojourn. We lead them around the hidden pitfalls, over obstacles and slash through the thickets of the formerly unknown territories until they have gained enough knowledge of this new terrain to have gained a reasonable mental map of what the real world journey may entail, as well as a glimpse of the jewels and vistas that lie at the end of the rainbow arc of their new found quest. This journey of the mind, the writer’s consciousness leading the reader’s, is the bulk of our words, the body of our story. But if it ends there, it is a vicarious journey only, and fails to impact our consensual world. An impactful story is one that somehow engages not only the mind but also the will. A call to action is how the writer will move mountains with very little motion of the pen. As a writer, I find it easier to “make it rain” when I’m working with companies and businesses whose mission I can get passionate about. When there’s passion, the creative fire burns. And the specified knowledge of the entrepreneur feeds the flames. That type of symbiosis can make for some huge-impact content.